Fuzzy paws. Purring. Silliness. That is was our house is filled with now that we have a kitten. We lost our older cat and thought maybe we would go cat-less for a while, but it became impossible to ignore the imploring looks from my son. Not one to resist the thought of a kitten, I succumbed to the pressure. 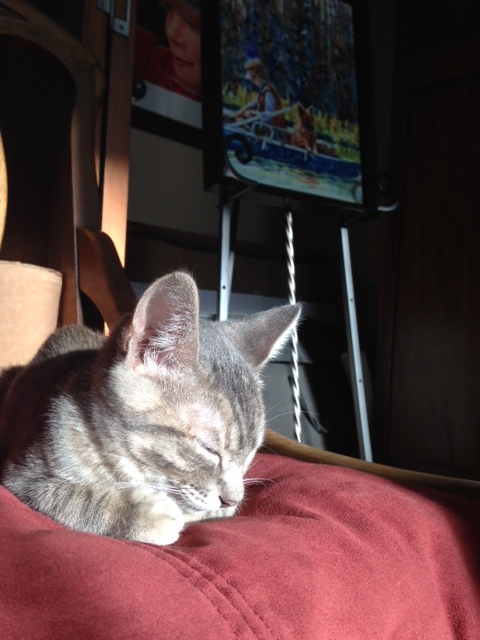 But it proved to be love at first sight with this little kitty we brought home and named “Luna”. She is a fiesty little purr-machine, a contradiction in behavior. One minute she is tearing through the house with abandon and the thundering feet of a buffalo, the next minute purring in our arms or giving us a no-claw hug of sweetness. I’m bewitched. So, of course, I feel the need to express myself on canvas and did so recently. 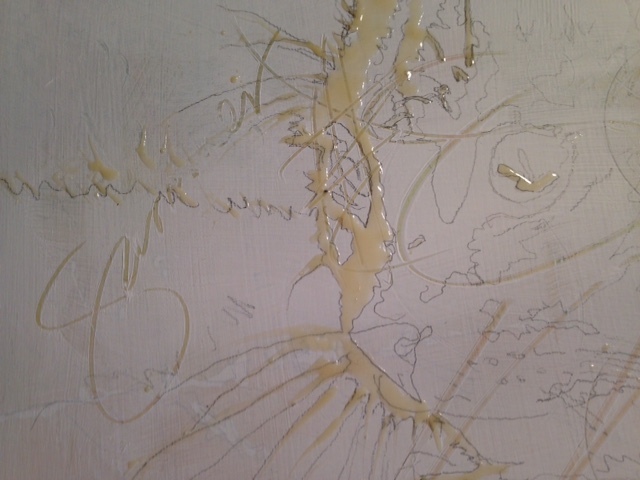 I had gone through a rash of three (yep, THREE) paintings that I began and ended up wiping off. Usually, I don’t have as many failures! But when I took a photo of Luna, sitting in the window, with my zoom lens, I knew this one would be a winner. See? It pays to paint what you love! Proof in the pudding right here. I began with a closely cropped photo, not a lot of background. Before the gesso undercoating dried, I collaged into it and scraped loops, marks, scribbles, and the word “summer” into the wet material. This is intended to give the painting a feeling of freedom, fun, summertime, and warmth. You can see in the above photo the liquid mask, which has bee painted on all the areas that I wanted to preserve as white. You may also be able to see the word “summer”, etched into the gesso on the left side of the image. 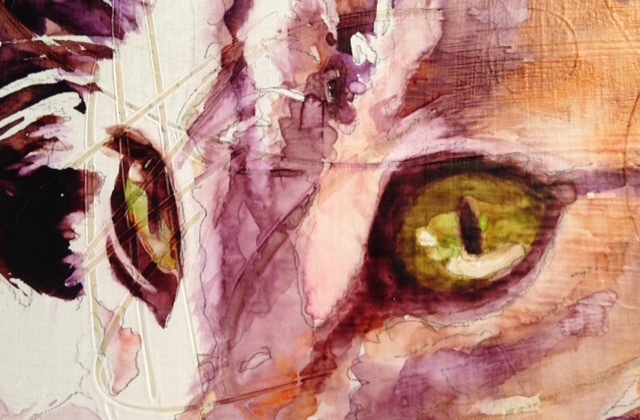 As I usually do when painting an animal, I begin with the eyes, as they have all the magic. If the eyes don’t work, nothing will. 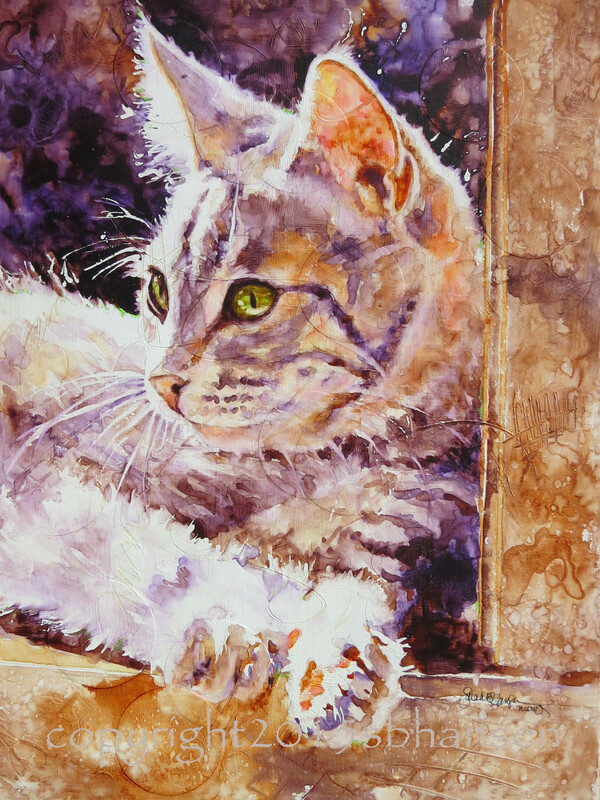 After the eye colors and values were laid in, I worked on the very dark background, choosing the darkness as a strong highlight to the brightly-lit fur. Once the background was in and the general values in the fur established, I returned to the eyes to detail them out as perfectly as I could. 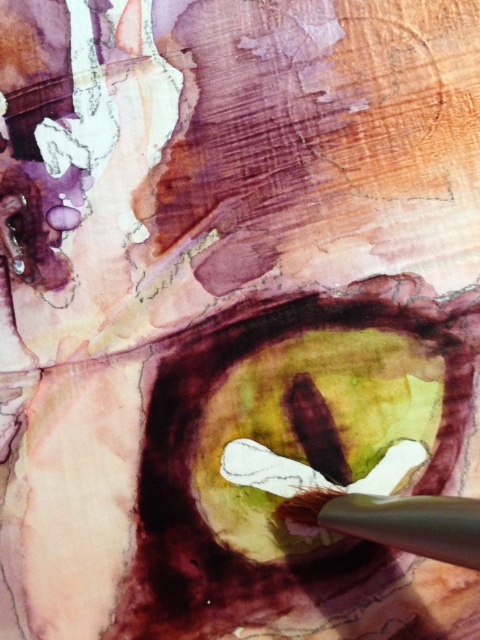 Above, you can see where I have removed the liquid mask after establishing the general color and value of the eye. The mask protected the light reflections within the eye. Once I removed the mask, I softened the edges of the reflections and added in a bit of blue color to deepen the value. 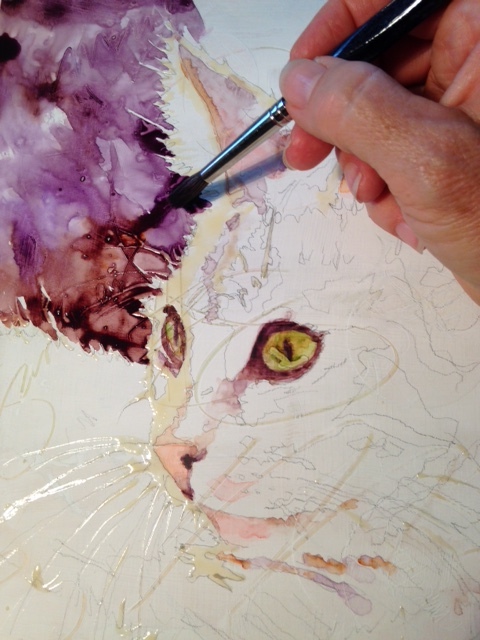 After the eyes were finished, I wet the edges of the cat fur and fuzzy paws, making sure reflections in the fur were warm and the texture soft where they needed to be. Just look at those paws!! So cute! This painting glows! The texture is crazy, giving us a tangible feel of fur and fun. Little Luna personified, planning a pounce while deceptively sunning herself in the windowsill. This may be my favorite painting so far. Though, if you know me well, you know I say that frequently. Enjoy my little Luna. Hi Sarah, Pleased to follow your art and other interests. Looking forward to lots of inspiration. Thank you so much, Adele! Wonderful work on your oil paintings. I love the wine and grapes you did for your friend. Isn’t it fun!! That’s a lovely painting! Wonderful!